Stell on Air is a property providing self catering in Stellenbosch for up to 6 guests visiting the Cape Winelands region. 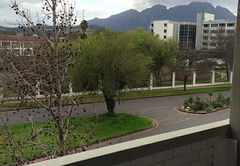 Stell on Air is a spacious two bedroom apartment found in a central position in Stellenbosch. 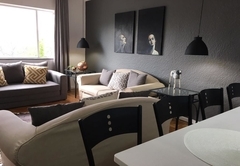 The apartment is close to a number of shops, restaurants, banks, art galleries and museums. This university town is surrounded by vineyards and is close to many wonderful attractions. This two bedroom apartment sleeps four adults and two children. 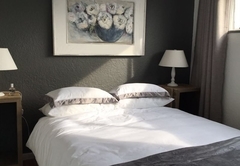 The main bedroom has a King-size, extra length bed and the second bedroom has a double bed. There is also a sleeper couch in the lounge. The bathroom is shared and has a shower. The living area has plenty of comfortable seating and a TV with satellite. Wi-Fi is also available to our guests. 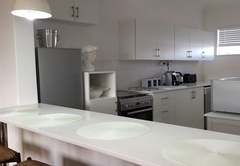 The kitchen has a breakfast bar where you can enjoy your meals and the kitchen is well equipped with everything you may need during your stay including a stove, oven, fridge, microwave, kettle, crockery, cutlery, cookware and glassware. There is also a balcony looking down over the street. Secure parking is available behind remote controlled gates. Two bedroom Apartment. Main bedroom with king size extra length bed. 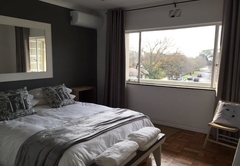 Second bedroom with double bed. 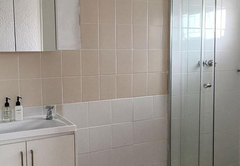 Sleeper couch in lounge Shared bathroom with shower. Fully equipped kitchen with dishwasher, microwave and gas stove. Free Wi-Fi. Secure parking. Balcony. 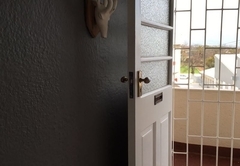 Great location for central Stellenbosch, the flat is well equipped and owners very accommodating. Only slight criticism is the advert says secure parking and there was none. Parking outside on the road was no problem though. Would stay again when visiting the area. Response timeStell on Air typically responds to requests in 5-10 minutes.